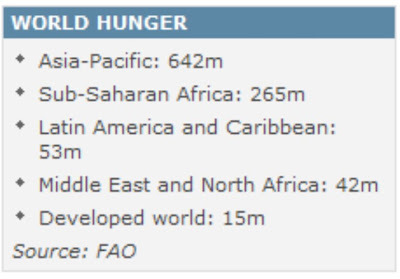 Just 15 million people are left hungry in the developed world. "The silent hunger crisis - affecting one-sixth of all of humanity - poses a serious risk for world peace and security," said Jacques Diouf. "We urgently need to forge a broad consensus on the total and rapid eradication of hunger in the world and to take the necessary actions." The increase in the number of hungry people was blamed on lower incomes and increased unemployment, which in turn reduced access to food by the poor, the UN agency said. But it contrasted sharply with evidence that much of the developed world is richer than ever before. "It's the first time in human history that we have so many hungry people in the world," said FAO spokesman Kostas Stamoulis, director of the organisation's development department. "And that's a contradiction, because a lot of the world is very rich despite the economic crisis." Mr Diouf urged governments to provide development and economic assistance to boost agriculture, particularly by smallholder farmers. "Investment in agriculture must be increased because for the majority of poor countries a healthy agricultural sector is essential to overcome poverty and hunger and is a pre-requisite for overall economic growth," he said. The UK's international development ministry (Dfid) said the figures wer e "a scandal" and said it was helping some of the poorest farmers in the world to boost the amount of food they produce. "In the last year we have pledged more than £900 million to lift millions out of hunger to help farmers boost agriculture production," a Dfid spokesman said. The UN warns that poor people living in cities will probably face the most severe problems in coping with the global recession, because lower export demand and reduced foreign investment are likely to hit urban jobs harder. Many migrants to urban areas would be likely to return to rural areas, it added, transferring the burden. Incomes have also dropped "substantially" in some developing countries where families depend on remittances from relatives working abroad. With the financial crisis hitting all parts of the world more or less simultaneously, developing countries have less room to adjust, the UN agency says. Among the pressures is the reality that borrowing from international capital markets is "more limited" in a global crisis, the FAO said. Food costs in developing countries now seem more expensive, despite prices in world markets declining during the food and fuel crisis of 2006-08, it added. They remained on average 24% higher in real terms by the end of 2008 compared to 2006. "For poor consumers, who spend up to 60% of their incomes on staple foods, this means a strong reduction in their effective purchasing power," the FAO said. Hi Aftab, read your article. Thanks for these updates ! !We have to see where this situation is going to take us now.